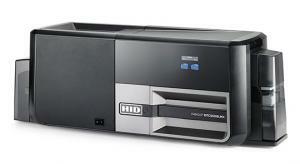 Fargo ID Card Printers are easy-to-use, versatile and very reliable solutions to print professional ID Cards on demand. 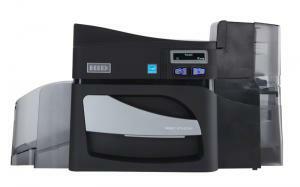 Robust ID card printers for superb credentials. 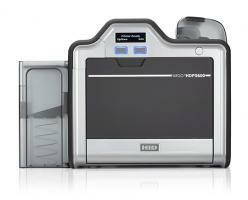 The most reliable, high duty performance ID card printer in the industry. High throughput credential personalization and issuance. WHAT ARE THE DIFFERENT TYPES OF FARGO ID CARD PRINTERS? 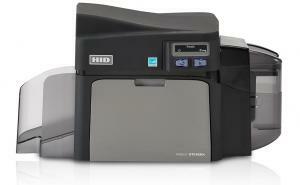 Fargo offers a wide range of ID card printers to meet every ID requirement. From entry-level card printers to highly secure laminating card printers, find out which Fargo ID card printer will answer your needs. 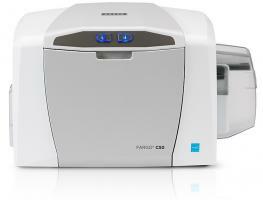 Fargo C50: Entry-levelsolution to print high-quality badges on a budget. Fargo DTC1250e: Replaces Fargo DTC 1000. Ideal for small-to-medium businesses in need of a reliable and fast solution to print high-quality ID cards on demand. 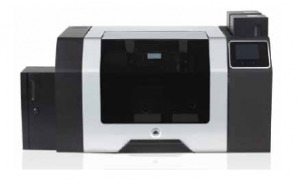 Fargo DTC1500: Single- or double-sided direct-to-card printing/encoding, single-sided lamination, and a built-in, custom watermark overlay function for security images and resin-scramble data protection making duplication impossible, all at low cost. Fargo DTC4250e: Replaces Fargo DTC 4000. Available as a single or dual-sided model, the Fargo DTC 4250e ID card printer delivers secure credentials for all your applications. Fargo DTC4500e: Replaces Fargo DTC 4500. 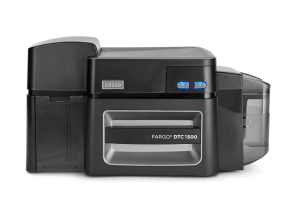 Available as a single or dual-sided model, the Fargo DTC 4500e ID card printer is loaded with security features to ensure maximum card security. 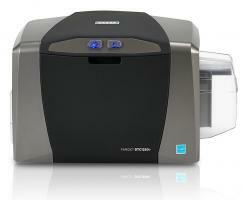 Fargo HDP5000: Get unmatched print quality with this retransfer Fargo ID card printer. Encoding and lamination options are available. Fargo DTC5500lmx: Premium direct-to-card printing and the quickest, most cost-efficient and wasteless lamination solution available; provides reliable, high-volume secure-card production at an ultra-low cost-per-card without sacrificing quality. A complete printer and lamination solution. Fargo HDP5600: Retransfer printer and encoder uses proven 5th-generation HDP technology and offers several card-encoding options and the highest printing resolution available for those who need to routinely issue high-definition ID cards. 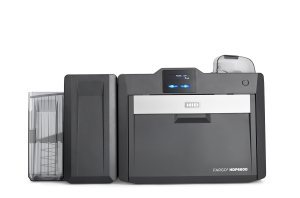 Fargo HDP8500: Designed for high-volume and high-security applications, the Fargo HDP8500 combines the benefits of a retransfer printer and state-of-the-art features such as dual input hoppers or a card flattener. 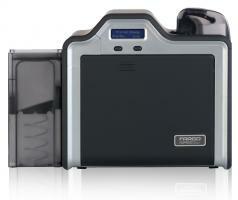 WHICH FEATURES SHOULD I CONSIDER WHEN BUYING A FARGO ID CARD PRINTER? Direct-to-card printing vs. retransfer: Fargo offers direct-to-card printers but for over the edge printing, retransfer ID card printers are also available. Retransfer Fargo ID card printers provide unmatched print quality, even on uneven surfaces (proximity cards, smart cards, or pre-punched cards). USB vs. Ethernet: Fargo ID card printers come with USB connection but if your printer will be on a network, don�t forget to select a printer with Ethernet connectivity. Windows vs. Mac: make sure that the printer that you select is compatible with the operating system that you use, especially if you are using a Mac. Basic vs. encoding options: if you need to print and encode data on magnetic or smart cards, opt for a card printer with the right encoder. All Fargo ID card printers offer optional encoding capabilities. Single vs. dual-sided lamination: some Fargo ID card printers offer single or dual-sided lamination modules. Laminating your cards helps reduce the risk of counterfeiting and tampering while extending the lifespan of your cards. WHICH TYPES OF LAMINATES DO FARGO ID CARD PRINTERS OFFER? Some Fargo ID card printers � DTC4500, HDP5000 and HDP8500 � are available with a lamination module to add an extra layer of protection to your printed cards.